If you’ve ever had a fly problem in the house, you know just how aggravating these pests can be—and sometimes arming yourself with a fly swatter isn’t enough. Whether you’re want to be proactive with your pest control efforts during your spring cleaning, or you’ve found yourself the unwilling host of a swarm of house flies in the dead of summer, there are many natural fly repellent techniques that you can use to keep your kitchen insect-free. In this article, we’ll show you 15 homemade methods of fly control. These tips and techniques are cost-effective and easy to make, and use ingredients that you can feel comfortable using around your home – even if you have kids and animals around. Whether you’ve got fruit flies, horse flies, mosquitoes, or other flying insects trying to hang around your house, you can use one of these home remedies. This easy and natural fly repellent is quick to make and uses ingredients you likely already have around the house. Pour the ingredients into a spray bottle and mix well. Spray anywhere flies hang around whether inside or outside. This is one of our favorite homemade fly traps because it only requires two ingredients, plus it’s another one that smells great! Cut a lemon in half and stick cloves all over the fruit. Place the fly trap in the area where you want to keep bugs away. This is an excellent insect repellent if you plan on spending some time outdoors, like for a picnic or an outdoor event. You’re probably already familiar with citronella oil as a natural mosquito repellent, but the smoke from citronella candles can be effective against other insects, as well. Using citronella candles offers protection from bugs on two fronts—citronella essential oil is a natural irritant, as is smoke. Light a citronella candle and wave the smoke around in the infested area—you should notice an instant decrease in the bugs around you. Though it might seem that these flying pests appear out of nowhere, they are, of course, coming from outside. Though you can’t get rid of all of the insects in your yard and around the exterior of your house, working control the bug population in your immediate outdoor surroundings can help keep them from getting inside. One great outdoor pest control method is to plan an herb garden. Lavender, rosemary, basil, lemongrass, mint, and many more herbs are a powerful insect repellent. It’s also important to avoid standing water, keep your gutters and drainage areas clean and clutter-free, and make sure any outdoor plants are healthy and free of rot. These tips don’t only work for flies; they will also help you get rid of gnats outside, as well as mosquitoes and other bugs. This technique may sound simple—and it is!—but there is some science behind this method, and even entomologists recommend it. Flies have compound eyes, with approximately 3,000 lenses per eye. Usually, that works to their advantage, allowing them to detect movement and shifting light patterns. By filling a clear plastic bag with water and hanging it outside—around doorways and other entrances—you will completely throw off flies, as the water reflects light in all directions. However, as this method relies on light, it only works during daylight hours. This is one of the easiest natural ways of getting rid of house flies. Hold onto your fresh orange or lemon peels and place them near the infested area. You can put them in a small cloth or cotton teabag if you prefer, but remember to rub your homemade traps now and then to freshen the scent. If you don’t want to leave peels sitting around, you can also make a DIY fly spray using citrus oils. Please note that this method is not for fruit flies, as they will be attracted instead of repelled by the fruit. As the name suggests, this fly spray uses a lot of essential oils. We love using oil blends in our DIY pest control recipes because they smell great and they work! Mix all the ingredients in a spray bottle. This recipe has a strong smell and packs a bigger punch than more straightforward sprays. As such, it is best for use outside or in barns around farm animals. If you’ve ever wondered what repels fruit flies, essential oils are one of the top answers. Any recipe containing oils is great for the kitchen in the summer. Herbs aren’t the only thing you should be planting to keep bugs away. Many carnivorous plants will help you take care of your unwanted guests. Plants like the Venus Fly Trap or Sundew will not only kill flies for you but will also help reduce clean up. They will add a bit of color to your house while also trapping, attacking, and digesting flies. This homemade bug spray is perfect for house flies, and you can also apply it to your skin. Mix witch hazel and apple cider vinegar in a spray bottle, and then add eucalyptus oil and shake well. You can use this fly repellent spray inside and outside, as well as on your body. Vinegar is the perfect bait for the irritating bugs commonly referred to as fruit flies, who are called vinegar flies. These bugs can’t resist the lure of vinegar, which makes it the perfect bait for a home made gnat trap. Pour some cider vinegar into a Mason jar or a soda bottle that’s been cut in half, putting in just enough to cover the bottom. Add in one drop of dish soap and cover the opening with plastic wrap, poking a few holes in the top. The flies will dive in for the vinegar and then get stuck by the soap. If you’re more concerned with keeping flies off your skin than you are about keeping them out of your house, then this essential oil bug repellant is perfect for you. Mix the two oils and rub on your wrists, neck, or other pulse points as needed. Flypaper kills bugs by luring them to the paper and then trapping with the adhesive. Making your own flypaper is easy, but takes a little time to allow the paper to soak and dry. Cut a brown paper bag into strips that are about 2 inches wide. In a pot, bring equal parts corn syrup and water to a boil, stirring occasionally. Remove from heat and then put the paper strips into the mixture. Allow the paper to soak for at least 4 hours before removing them. Let them dry for about two or three hours. Hang the flypaper with thread in bug-infested areas inside or outside your home. Hairspray is probably the easiest homemade fly spray around—you likely already have a bottle in your bathroom cabinet, and you don’t need to add anything else to the mixture. The heavy spray, when spritzed around the house, will slow the flies down as their wings get stuck. This will make it easier for you to beat them down with a fly swatter or rolled up newspaper. While apple cider vinegar helps in trapping and killing flies, malt vinegar works in repelling flies. Boil a small amount of malt vinegar on your stove. Remove from heat and place the pot of hot vinegar in the infested area. Once the flies get a whiff of the vinegar, they’ll head in another direction. Sugar water is another mixture that will attract and trap flies. Dissolve some sugar in water and then pour it into a Mason jar or bowl. Place plastic wrap over the top of the jar or bowl and then poke holes into the plastic. 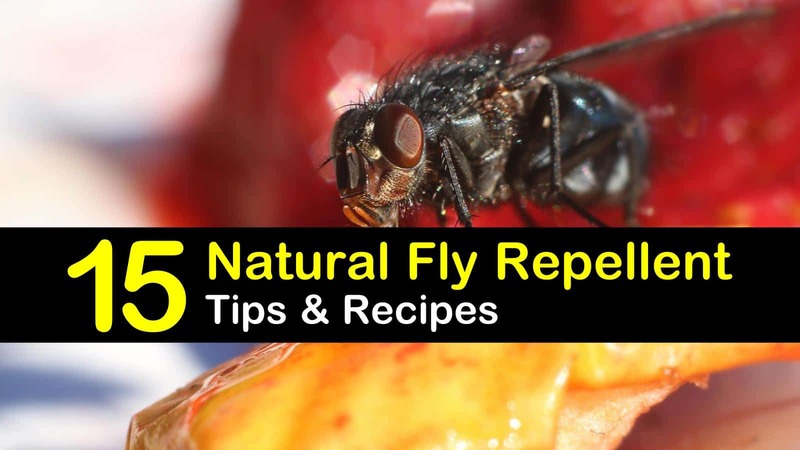 With these excellent tips and techniques, you’ll never have to wonder what keeps flies away ever again! Next time you notice flies in your home, whip out a couple of ingredients and put together one of these quick and easy insect repelling methods. 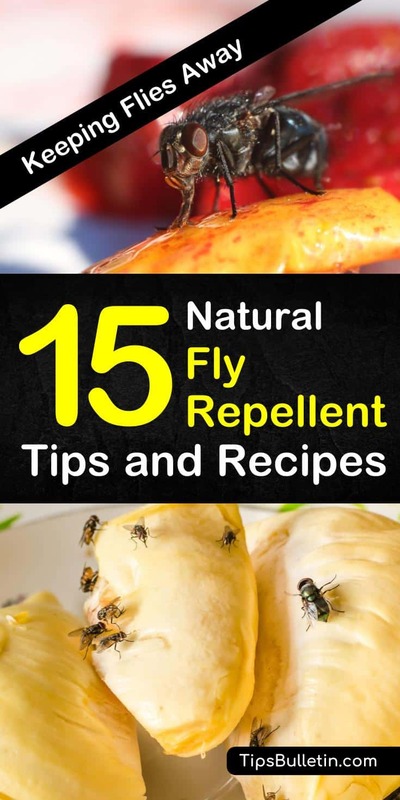 If this article taught you how to get rid of flies, then share these natural fly traps and repellents with your friends and family online.